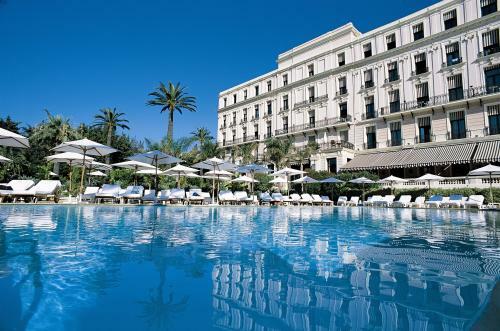 Garden Beach Hotel is in the centre of Juan-les-Pins, 30 minutes from Nice International Airport. It sits opposite the Bay of Cannes and offers direct access to a private beach on the Côte d'Azur as well as a view of the Cap d'Antibes. The rooms are air-conditioned and have flat-screen satellite TV. They all offer views of the sea or the Gould pinewood. Guests can relax in the hotel's spa, which includes a hot tub, hammam, indoor swimming pool and body treatments with Terraké products. The Garden Beach Hotel’s restaurant, La Frégate, serves fresh seafood and Mediterranean cuisine. In the summer time you can enjoy your meal on the terrace while admiring unrestricted views of the sea. A daily breakfast is served and can be enjoyed on the terrace overlooking the sea. In the evening, enjoy a drink from the bar’s terrace. Additional features include a meeting room, 24-hour valet service, fitness centre and free Wi-Fi access throughout. The private beach is open every day (depending on weather conditions) from 15 April until 15 October. A beach space, towel and parasol are available from EUR 15. Access to the fitness centre is available at an additional cost, and is reserved for guests over the age of 18. Please note that Garden Beach Hotel will be closed from 18 November 2012 until 7 March 2013. Please note that the valet service is available at EUR 28 per vehicle per day.